Sir Samuel White Baker (June 8, 1821 - December 30, 1893) was an English explorer to Africa. Seeking the headwaters of the Nile River, he explored the tributaries of the Upper Nile River and discovered Lake Albert. An abolitionist after a fashion, he sought to suppress the slave trade in the southern Sudan and bought a woman from the white slave trade markets off Transylvania, with whom he traveled extensively following the death of his wife. Well known for his exploits, Baker found himself snubbed by Victorian society because of this unusual arrangement, although they married before returning to England 10 years later. Baker was born in London, and educated partly in England and partly in Germany. His father, a West India Company merchant, hoped his son would became a businessman. After a short experience of office work proved him to be entirely unsuited to such a life. On August 3, 1843 he married Henrietta Biddulph Martin, daughter of the rector of Maisemore, Gloucestershire. Baker traveled with his first wife, to manage his family's plantations in Mauritius in 1844 and later established his own estates in Ceylon. The travels proved deleterious to Henrietta and she died in 1855. During his time in Constantinople, a year after Henrietta died, he purportedly bought a Transylvanian girl, Barbara Maria Szász, at a white slave auction in Vidin (now in Bulgaria). Renamed Florence, she became his second wife many years later, just before Baker returned to England for good. After two years in Mauritius the desire for travel took him in 1846 to Ceylon, where in the following year he founded an agricultural settlement at Nuwara Eliya, a mountain health-resort. Aided by his brother, he brought emigrants from England, together with choice breeds of cattle, and before long the new settlement was a success. During his residence in Ceylon he published, as a result of many adventurous hunting expeditions, The Rifle and the Hound in Ceylon (1853), and two years later Eight Years' Wanderings in Ceylon (1855). Baker’s hunting skills were renowned, and he once gave a demonstration to friends in Scotland of how he could, with dogs, successfully hunt down a deer armed only with a knife. After a journey to Constantinople and the Crimea in 1856, he found an outlet for his restless energy by undertaking the supervision of the construction of a railway across the Dobrudja, connecting the Danube with the Black Sea. After its completion, he spent some months in a tour in south-eastern Europe and Asia Minor. In March, 1861, he started upon his first tour of exploration in central Africa. This, in his own words, was undertaken "to discover the sources of the river Nile, with the hope of meeting the East African expedition under Captains John Speke and James Grant somewhere about the Victoria Lake." After a year spent on the Sudanese – Abyssinian border, during which time he learned Arabic, explored the Atbara river and other Nile tributaries, and proved that the Nile sediment came from Abyssinia, he arrived at Khartoum, leaving that city in December, 1862 to follow up the course of the White Nile. Two months later at Gondokoro he met Speke and Grant, who, after discovering the source of the Nile, were following the river to Egypt. Their success made him fear that there was nothing left for his own expedition to accomplish; but the two explorers gave him information which enabled him, after separating from them, to achieve the discovery of Albert Nyanza (Lake Albert), of whose existence credible assurance had already been given to Speke and Grant. Baker first sighted the lake on March 14, 1864. After some time spent in the exploration of the neighborhood, during which Baker demonstrated that the Nile flowed through the Albert Nyanza—of whose size he formed an exaggerated idea - he started upon his return journey, and reached Khartoum, after many checks, in May, 1865. 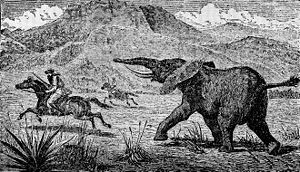 Explorer and large game hunter Samuel Baker chased by an elephant. In the following October he returned to England with his wife, who had accompanied him throughout the whole of the perilous and arduous journey. In recognition of the achievements by which Baker had indissolubly linked his name with the solution of the problem of the Nile sources, the Royal Geographical Society awarded him its gold medal, and a similar distinction was bestowed on him by the Paris Geographical Society. In August, 1866 he was knighted. In the same year, he published The Albert N'yanza, Great Basin of the Nile, and Explorations of the Nile Sources, and in 1867 The Nile Tributaries of Abyssinia, both books quickly going through several editions. In 1868, he published a popular story called Cast up by the Sea. In 1869, he traveled with King Edward VII (who was the Prince of Wales at that time) through Egypt. Despite Baker’s travels with the notorious Prince of Wales, he never received quite the same level of acclamation granted to other contemporary British explorers of Africa. Queen Victoria, in particular avoided meeting Baker because of the irregular way in which he acquired Florence, not to mention the fact that during the years of their mutual travels, the couple were not actually married. 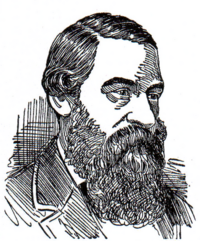 A court case involving his brother Valentine Baker also harmed Samuel Baker’s chances of wider acceptance by the Victorian establishment. In 1869, at the request of the khedive Ismail, Baker undertook the command of a military expedition to the equatorial regions of the Nile, with the object of suppressing the slave-trade there and opening the way to commerce and civilization. Before starting from Cairo with a force of 1,700 Egyptian troops—many of them discharged convicts—he was given the rank of pasha and major-general in the Ottoman army. Lady Baker, as before, accompanied him. The khedive appointed him Governor-General of the new territory of Equatoria for four years at a salary of £10,000 a year; and it was not until the expiration of that time that Baker returned to Cairo, leaving his work to be carried on by the new governor, Colonel Charles George Gordon. He had to contend with innumerable difficulties—the blocking of the river in the Sudd, the bitter hostility of officials interested in the slave-trade, the armed opposition of the natives—but he succeeded in planting in the new territory the foundations upon which others could build up an administration. He returned to England with his wife in 1874, and in the following year purchased the estate of Sandford Orleigh in south Devon, his home for the rest of his life. He published his narrative of the central African expedition under the title of Ismailia (1874). Cyprus as I saw it in 1879, was the result of a visit to that island. He spent several winters in Egypt, and traveled in India, the Rocky Mountains and Japan in search of big game, publishing in 1890 Wild Beasts and their Ways. He kept up an exhaustive and vigorous correspondence with men of all shades of opinion upon Egyptian affairs, strongly opposing the abandonment of the Sudan by the British empire and subsequently urging its reconquest. Next to these, questions of maritime defence and strategy chiefly attracted him in his later years. He died at Sandford Orleigh in 1893 and is buried in Brompton Cemetery, London. History of "Samuel White Baker"
This page was last modified on 17 August 2015, at 22:36.